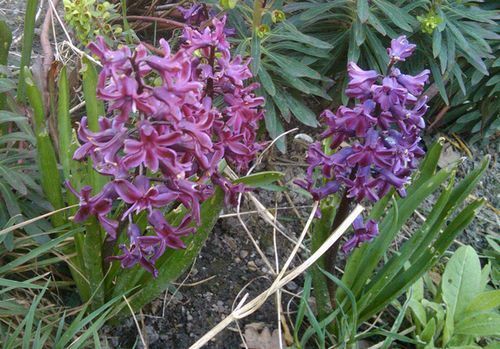 Hyacinthus plants are grown from hardy bulbs. They have long flower stalks that have a head of flowers of blue, white, purple, red, pink, or yellow. They flower in the middle of spring. Purple Hyacinth by Marketing Specific, Inc.
Hyacinth (Hyacinthus 'Woodstock') by Westher. 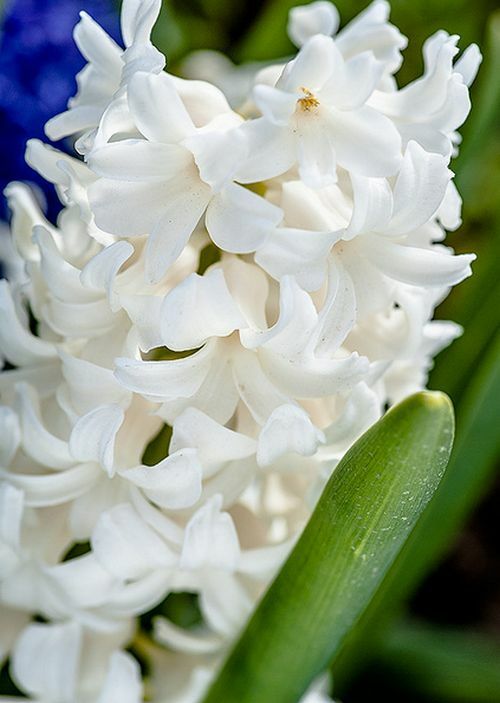 Common Names: Hyacinth: Common; Dutch; Garden. Height: 6 to 18 inches (15 to 45 cm). Growing Region: Zones 6 to 8. Flower Details: Purple, yellow, blue, pink, red, white. Spiked cluster with two to fifty flowers. Trumpets. Fragrant. Growing Hyacinth Outside: Usually grown from Hyacinthus bulbs as seed grown plants will not bear flowers for about four to six five years. Bulbs: Plant tip upwards at a depth of 3 to 8 inches (8 to 20 cm) dependent upon soil density (deeper in light soils). Early in Autumn. Spacing 6 to 10 inches (15 to 25 cm). Seeds: May not grow true. 1/2 inch (12 mm). Late summer, or the start of autumn. Germination time: one month to one year. Seeds should first be sown into flats. Next sink the flat into the ground in an area that offers shade, preferably close to a wall that faces north. Provide a glass/plastic covering. Keep an eye on the flats to ensure that the soil remains moist and to check if seedlings have emerged. After two years of growth, transplant the seedlings to their final location in the autumn. Requirements and care: Full sunlight or light shade. Good drainage. Soil pH 6.0 to 7.0. Rich soil. Regular watering during dry periods until plants finish blooming. Provide an early spring and an autumn feed. Once blooming has finished tidy by removing dead flowers. Winter mulch. Plants last about four years. Propagate: from offsets. Miscellaneous: Bulbs are poisonous and may cause skin irritations, it is recommended to wear gloves when handling Hyacinth bulbs. It is best to grow Hyacinth from bulbs, the depth that they are sown depends on the soil type, plant them about 13 cm deep in light soil and 7 cm deep in heavier soils. It is best to plant hyacinth bulbs in the early autumn into an area of the garden that is sunny or receives partial shade. They prefer a rich slightly acidic to neutral soil (pH 6 to 7). It is quite difficult to grow Hyacinthus plants from seeds. if you plan to then sow seeds into flats at a depth of about 12mm. Bury the flat into a shady part of the garden and cover with glass. The soil should be kept relatively moist. Germination can take from one month to one year. If seedlings do appear let them grow until they are strong (at least a year) and transplant to their final location in the autumn. It will take from between three to six years until hyacinth grown from seed will flower. Looking after Hyacinth requires a few simple steps. they should be fed in the spring and autumn, and require regular watering during the dry months of summer. Once flowering has finished the dead flowers should be removed. It is best to supply a mulch to Hyacinth plants to protect them from the cold. 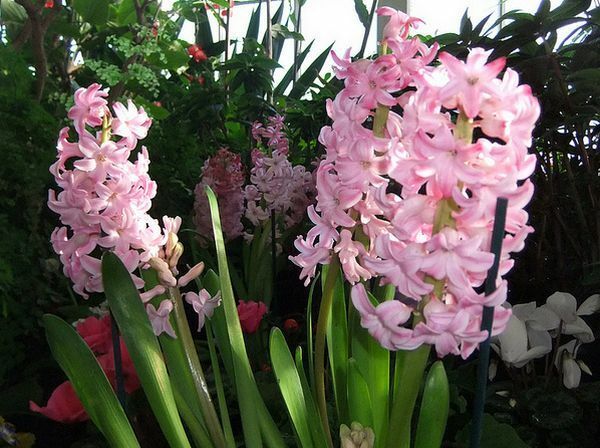 Hyacinth typically have a good flowering life span of about 4 years. If you require more Hyacinthus plants then it is probably best to grow them from bulbs bought from a garden center.